Permeation Tubes - An Overview | KIN-TEK Analytical, Inc. The purpose of a gas standard is to establish accurate reference points for the verification of an analysis. Static mixtures in gas cylinders are often unreliable and inaccurate at the levels (ppm to ppb) that analytical technology now demands. In gas cylinders containing low level mixtures, the trace components often adsorb to, or react with, the cylinder walls causing the standard to be inaccurate and unreliable. Also, it may be impossible to get a matrix gas that is completely free of the trace component, thus making it impossible to get a true reference point with a cylinder mixture. These problems are solved by using permeation tubes in lieu of gas cylinders. KIN-TEK manufacturers permeation tubes in two basic types – disposable and refillable – for over 500 chemicals. 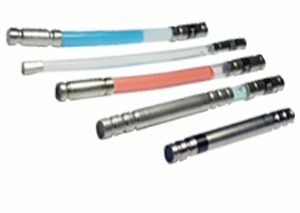 Disposable Permeation tubes are tubular devices about the size of a pencil with liquid component compound sealed inside. The component compound slowly permeates through the tubing wall creating a very small flow of component vapor. Disposable tubes have a finite operating life and are discarded at the end of that life. They are primarily used to make lower and medium concentration mixtures. 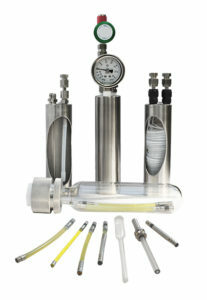 Refillable Permeation tubes generally offer a broader range of concentration than disposable tubes. They are often recommended for long-term service and for applications requiring a broad range of calibration points. 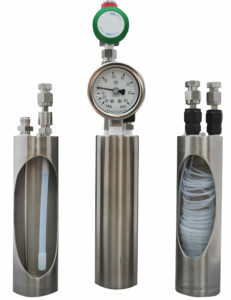 Refillable tubes are used for higher concentration mixtures. They are also used for high pressure gas components (CH4, C2H4, O2, H2, etc.) where the gas must be frequently replenished. KIN-TEK offers factory refill and recertification services; however, some tubes may be refilled by the customer (with appropriate safety measures in place). High emission tubes in gas service are refilled in-situ, using controls in various models of KIN-TEK Gas Standards Generators.